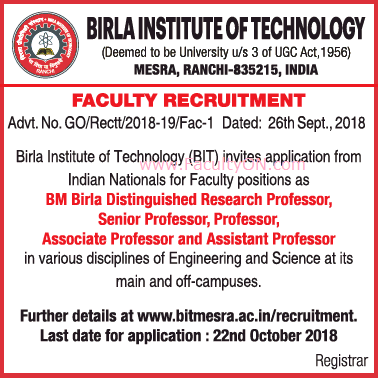 Birla Institute of Technology, Ranchi has advertised in THE TIMES OF INDIA newspaper for the recruitment of Teaching Faculty- Research Professor / Senior Professor / Professor / Associate Professor / Assistant Professor Plus Non-Faculty jobs vacancies. Interested and eligible job aspirants are requested to apply on or before 22nd October 2018. Check out further more details below. About College: Birla Institute of Technology, Mesra is an Indian institute of higher education and a deemed University under Section 3 of the UGC Act. It was established in the year 1955 at Mesra, Ranchi in the state of Jharkhand, India by the philanthropist and industrialist Late Shri. B. M. Birla. Ph.D with experience. For full details go to the pdf link provided at the end. 1. Applicants have to fill and submit the application form available at official website www.bitmesra.ac.in. Applicants should ensure that, the application is duly signed by the applicant, and forwarded through proper channel along with the required DD and other credentials as mentioned in point 07 and 08 of the information /instruction and send in a sealed envelope by registered post/ speed post to the Registrar, Birla Institute of Technology, Mesra, Ranchi – 835215 so as to reach him on or before 22 October 2018. Kindly super scribe the envelope with the post applied for, the Department and own phone number. 2. The Non-refundable Demand draft, towards application fee, shall be drawn in favour of "Birla Institute of Technology" payable at Ranchi. The amount of DD shall be Rs. 750/- for candidates belonging to SC/ST/PHs and Rs. 1500/- for candidates belonging to other categories. Candidates are advised to write their name, own phone number and post applied for on the backside of the demand draft.